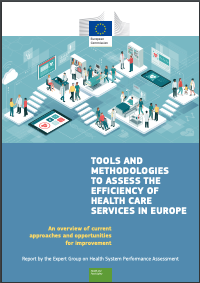 The EU Expert Group on Health Systems Performance Assessment (HSPA) published its report titled "Tools and methodologies to assess the efficiency of health care services in Europe: an overview of current approaches and opportunities for improvement" . National health care systems across Europe are increasingly confronted with the complex challenge of reconciling rising demand for health care services with available resources as a means to safeguard their long-term sustainability. At the same time, a consensus is emerging among researchers that up to 20% of current expenditure in modern health care systems can be categorised as either ineffective or wasteful. As European governments seek to exploit opportunities to reconfigure resources within their national health systems to deliver better-value care, the design complexity inherent to health care systems, as well as a series of methodological and data-related limitations, render the identification of specific sources of inefficiency in healthcare a difficult endeavour in practice.